U.S. Interior Secretary Ryan Zinke speaks during a news conference near Gold Butte National Monument in Bunkerville, Nev., on July 30, 2017. He was touring several national monuments as part of an ongoing review. 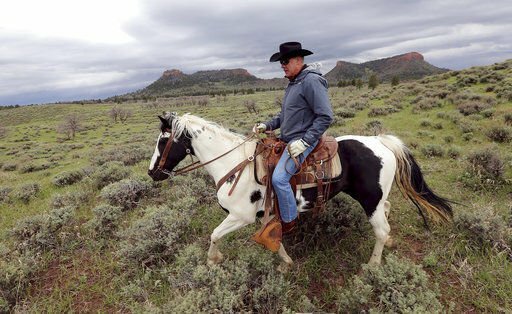 In this May 9, 2017, file photo, Interior Secretary Ryan Zinke rides a horse in the new Bears Ears National Monument near Blanding, Utah. Zinke on June 12, 2017, recommended that the monument be reduced in size and said Congress should step in to designate how selected areas of the 1.3 million-acre site are managed. Zinke has said that a few monuments on the list, including the Upper Missouri River Breaks in Montana, should remain as they are. That’s great news, especially for the 5,000 people who formally commented, telling Zinke to keep protecting the Breaks. Much as we appreciate that the Breaks with its wild and scenic river bluffs and bountiful hunting grounds is off the hit list, we must defend the other monuments in other states that remain at risk. The law that 16 presidents have used to establish 157 national monuments, seashores or maritime preserves was signed in 1906 by President Theodore Roosevelt. He designated 18 monuments. The first was Devil’s Tower, that steep rock that still draws climbers and campers to the northeast corner of Wyoming. The Grand Canyon, Zion and Olympic national parks started out as monuments designated under the 1906 Antiquities Act. Earlier versions of the bill proposed acreage limits on the size of such presidential designations. The bill that passed provided more flexibility to protect unique features on public land. For the past 111 years, the law has preserved American heritage. Most presidents have designated monuments, none have revoked their predecessors’ designations, and it is questionable whether revocation would be legal. However, President Donald Trump ordered the monument review with eye toward opening up these protected public lands to mineral development. Mining and drilling are part of our western heritage and an important sector of today’s economy. But not every place should have oil fields or open pit mines. The monuments still targeted for possible shrinkage or elimination now preserve ancient Native American ruins and unique natural features. Once these treasures are gone, there’s no bringing them back. National monuments protect land and historic features for future generations and also contribute to their states today. That’s why small business owners from half a dozen states gathered last week in Helena and Great Falls. They united to defend their livelihoods against political uncertainty. The business roundtables included Dan Irion, Taos Mesa Brewing Co., New Mexico, who draws business through the Rio Grande del Norte National Monument. Kevin Trimm, of Seek Outside in Colorado, depends on customers who visit Canyons of the Ancients National Monument. Peter Guzman, of the Las Vegas Latin Chamber of Commerce, spoke up for the Basin & Range National Monument. Suzanne and Joseph Cateltt, Utah businesses owners and members of the Escalante Chamber of Commerce, spoke for saving Grand Staircase Escalante National Monument. Bethany Flint, Blackfoot River Brewing Co., in Helena, supports the Breaks Monument. She and other Montanans joined with Business for Montana’s Outdoors to call attention to the value of all these monuments. We join these business people in supporting the preservation of all national monuments. These designations were not intended to be temporary or subject to changing political winds. In “The Bully Pulpit,” Doris Kearns Goodwin writes about Theodore Roosevelt visiting Arizona’s Grand Canyon in 1903 during a fierce debate about whether it should be preserved as a national monument or opened for precious metals mining. Zinke has declared himself a Teddy Roosevelt Republican. He should take that president’s advice and strongly recommend that Donald Trump let our national monuments be.